Mmp 250 & 410 flekso 4 kolory, sztanca rotacyjna do etykiet. Excellent rotary die cutter with the possibility of installing up to 5 flexo units. 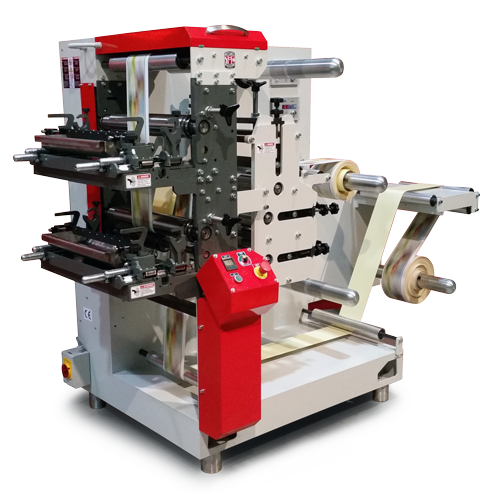 This robust machine is equipped in 1 rotary die cut units, 1 at the front and 1 at the back of the web. As a result, it is possible to sheets from a roll in just one pass! The machine is standardly equipped in 1 flexo unit. The flexographic printing unit enables the production of plain labels with a colored background and logo, as well as the application of a primer, varnish and other chemicals. Labels with a black mark at liner? No problem just after a few minutes you can work at full speed with a precise gap to mark registration! MMP 250 is not solely a label machine discover more possibilities! all the possibilities of the MMP 250 & 410. A considerably thought-out construction, manufactured using the highest quality steel, guarantees a robust and durable performance for many decades. Our machines are designed by engineers and not by accountants, who would reduce the manufacturing costs by exploiting unreliable materials. However, this does not imply that the price of our machines is highly expensive – on the contrary- we are very competitive regarding our pricing policy, on the market. Power of simplicity – such an approach enables us to create machines, while excluding any expensive and often unreliable electronics, not making any concessions regarding productivity! Our designers target is to provide a user-friendly machine, which works efficiently at a high-speed, is simple to operate, and will not limit the performance nonetheless, allows creating a wide range of products promptly and effortlessly. MMP can be equipped with an automatic web guiding system, UV curing, sheeted cylinder, and slitting tools. Moreover, the machine is capable of winding media in two directions. Implementing one flexo unit will enable producing labels with a uniform color background, logos, texts, barcodes, or black marks on the bottom. For manufacturers, who use inkjet technology for label manufacturing, the device grants the possibility to independently apply the primer. An advanced and highly precise system of cutting and slitting blades, along with the knowledge necessary to operate them, opens new opportunities for greater working efficiency. 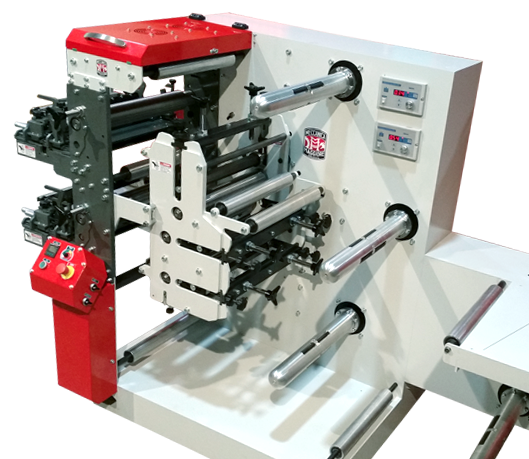 It is possible to extend the machine up to 5 flexographic units, which allows printing CMYK in HD quality. Set of special tooling for HD quality, incredible vivid colors and clear dots. 40% more quality when compared with other conventional flexo systems. the technical specyfication can be changed without previous warning.